At Creative infoway, design is something we lay a great emphasis upon. Great designs often make great apps and brings out the best of the app programmers as well. We have always believed that there should be close coordination between the design and programming teams to build the app you dream about. Apart from the design and development, we have a large team that is capable of facilitating communication to make the design process absolutely relevant and smooth. We’re committed to walking our clients through every single step of the process, and at Creative infoway, we understand that process doesn’t end when your app’s released into the wild. You need professional assistance after that in order to maintain visibility and boost profitability. UI is the abbreviation that stands for user interface and UX refers to user experience. Mobile user interface refers to the look and feel of the menu system on mobile device screen and how the menu responds to various types of input on the keypad or screen and how the software deals with all these – all these aspects accumulatively refers to mobile user interface or mobile UI. 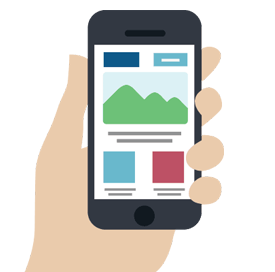 Mobile user experience typically refers to the user friendliness of the device and how it addresses the user’s perceptions and typical user specific attributes. User interface and user experience combined together constitute the key elements of the relation between the user and the device. A good user interface is optimized to provide variety of user friendly attributes corresponding to user experience and helps to optimize the features of the device and overall efficacy to a great extent. The present focus of the techies across the globe is undoubtedly on the rapidly evolving feature rich mobile devices and the corresponding evolution of user interfaces and experience. Naturally, in the time to come with more proliferation of smarter user interfaces the demand for innovative software support and design for new UI/UX seem to outgrow many other skill sets.